Found along the warmer Bushveld and Lowveld areas, especially the northern and eastern borderlines of the Northern Province and Mpumalanga, as well as in the northeastern KwaZulu-Natal area and in a game park in the Eastern Province. Together with the lion, the leopard, and maybe the elephant, the buffalo competes as one of the most dangerous of all animals to hunt. Most people might even say that it is THE MOST DANGEROUS! For if it isn't shot dead with the first shot, you need a very, very experienced hunter and solid sharpshooting at your side. If that's not available, don‚Äôt even start the hunt. The buffalo knows how to turn the table on a hunter: you may be too slow and too late to realize that you are the hunted! 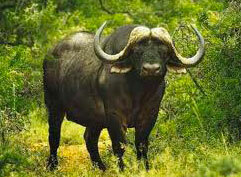 When wounded, it will dissapear among the hundreds of other buffalos of the herd, or take a well covered hide-out. Over the years, many of those pursuing hunters have hada sudden breaking of branches as their final sounds ever heard. They will not stop except if the final shot is, let alone in time and from the necessary calibre, but dead centre into the brain itself. The buffalo might even have its revenge hours and hours after the first shot. The gore from a buffalo is almost always fatal. The buffalo loves water and grasslands. Their horns may grow over 140 cm (over 50 in.) Although it did happen in the past, a single lion will have a battle royal if it decides to take on a full grown buffalo on its own.